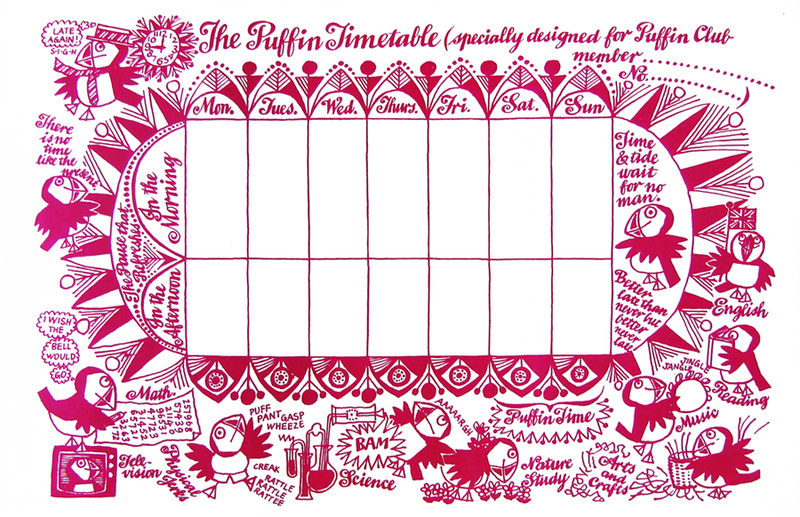 We all find it hard to work to a timetable – it restricts us and binds us, but this is a lovely one that was given away to Puffineers courtesy of the pen of Jill McDonald. Its only downside is that I would have hated to write on it and ruin its beautiful proportions and balance. Yes and I don't think photocopiers were readily available in those days, let alone scanners. Everything is a time table.Everything needs to be done.You just need to get your master or purpose right.I like to schedule always.So your image of the time table was so helpful.I wish you well on your work. Amazing! Today is Kaye Webb's birthday so I'm just researching a bit & came across your lovely blog. Talk about memory lane – I still have my badges (original & founder's) & various other Puffinry. I'll look it out one of these fine days. Thank you for this, a great treat! Our daughter was reading a puffin book today and found the details of the puffin club in the back. She desperately wanted to join. I'm a very sad that the club does not exist in the same way it once did.